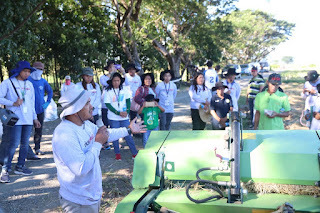 Funded by the Department of Agriculture’s Bureau of Agricultural Research, about 30 participants from four farmer groups (Pinagbuklod Na Adhika Agriculture Cooperative and Bantug – Bakal Irrigators Association) participated in the demonstration. “There are a lot of ways where rice straw can be optimally and profitably used,” Dr. Daniel Aquino, Study Leader and Center Director of PCC at CLSU said. Dr. Aquino said that every 100kg of rice straw contains about 4.5 to 4.7kg of protein, which can help support the maintenance, growth, and milk production of ruminants, namely cattle, carabao, goat, and sheep. Rice straw’s feed value can also be improved by spraying and/or ensiling with urea and molasses solution. A mature cattle or buffalo can consume about 15-20kg of rice straw per day, which means that rice straw from a hectare of paddy rice can support its fodder requirement for about 200-250 days. IRRI’s Senior Associate Scientist Carlito Balingbing gave a presentation on the different rice straw baler types and on baler safety measures. Engineer Balingbing and PhilRice Engineers Dr. Elmer Bautista and John Eric Abon also led the demonstration of the round and square balers. A survey and short discussion followed to gather feedback from participants about their preferred baler design. 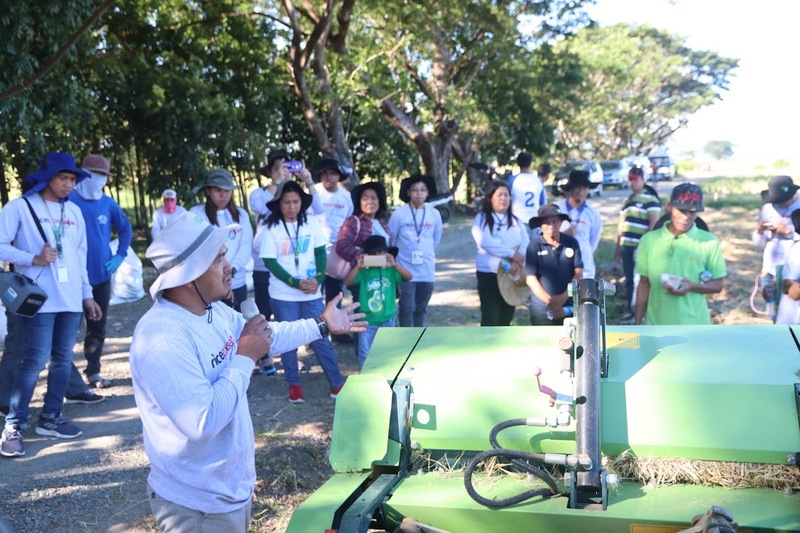 “I prefer the square type baler, but I hope it can be smaller so as to fit these narrow roads that we have,“ said farmer leader Francisco Ignacio, chairman of Pinagbuklod Na Adhika Agriculture Cooperative, a part of rice-based enterprise community RiceBis led by PhilRice. “I want a high-quality machine, so I am willing to pay the price reported to us, rather than a cheaper price that will compromise the quality,“ said Gorgonia Ebzon, member of the same cooperative. Mr. Rizal Corales, PhilRice expert on mushroom production from rice straw, lauded the farmers’ efforts to participate in the project and encouraged them to continue the cooperation and partnership, especially on mushroom production. “Without your support our project which aims to provide alternative livelihood in rice farming through proper mushroom production wouldn’t be successful,” he concluded. A series of demonstrations in other rice growing regions in the Philippines will be conducted in the coming months as part of the RiceStrawPH project.